This graph shows the occasions on which French consumer declared consuming smoked salmon in 2017. It appears that the most mentioned event was the end-of-year holiday season, with 47 percent of the respondents eating this product during this time of year. 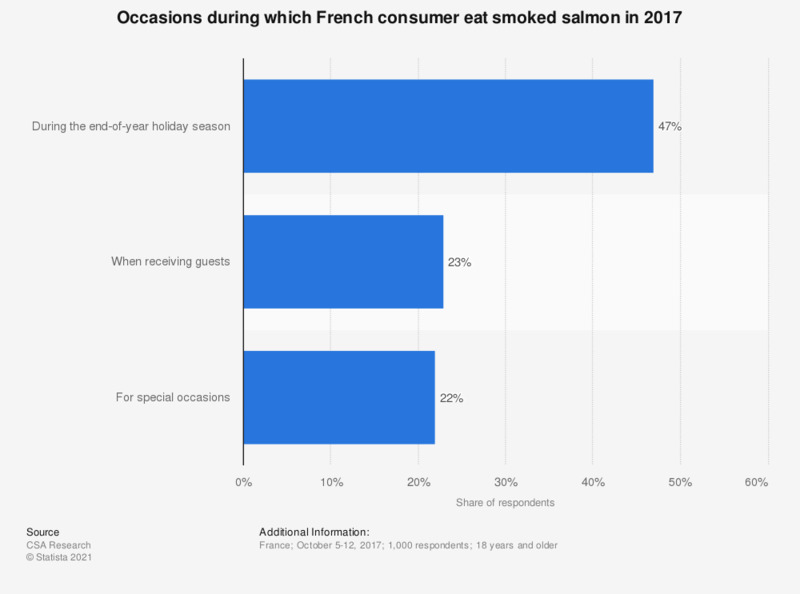 Receiving guests or other special occasions were named as occasions on which French consume smoked salmon by 23 percent and 22 percent of the surveyed, respectively. To what extent do you agree with this statement: "I am satisfied about the amount of meat I eat (I do not want to eat less meat)"? Why have you reduced or stopped your beef consumption in the last 12 months? Have you reduced or stopped consuming beef in the last 12 months?